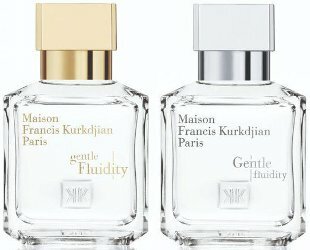 Maison Francis Kurkdjian's latest Duo Releases! Thread: Maison Francis Kurkdjian's latest Duo Releases! Will be a sure buy for me. Re: Maison Francis Kurkdjian's latest Duo Releases! I think the names will only result in confusion, especially for the casual fragrance buyer. Fate gives all of us three teachers, three friends, three enemies, and three great loves in our lives. But these twelve are always disguised, and we never know which one is which until we've loved them, left them, or fought them. Get back in your thread, hednic! Can you imagine also the clueless sales people? Terrible names. But if the scents are great, I'm very interested! The lowercase g capital F one sounds like it could be right up my alley. Probably so, but then again, how many casual fragrance buyers purchase MFK fragrances and ask for them by name? I think that most casual buyers would be heavily led by a Sales Associate. I'll be on the lookout for these to test them, they sound interesting. I can imagine a situation where no distinction is made between the upper and lower case letters, and most people call them "Gentle Fluidity Gold" and "Gentle Fluidity silver" after the colours of the caps. That was the first thing I thought of! Of course, any confusion between these two fragrances will amount to nothing more than the tiniest blip on the perfume radar compared to Dior's "Miss Dior" name fiasco. The really amazing thing is Dior continues to do it even after receiving a lot of complaints! In any case, I bet marketers dreamt up the Gf and gF names, not Francis. Quite an interesting concept to have the exact same ingredients just blended in different proportions. Guess we'll end up just labelling them GF gold and GF silver. Reads like he's saying one is a masculine and one is a feminine but he just didn't want to specify which was which (doubt this is how he meant it to come accross though), but in the end I like the principle of just letting the individual choose based on their own perception. I'll wind up sampling these when I visit my local Neimans. Think I like the sound of the Gold. "outgoing base note of ambery woods"
I don't think casual fragrance buyers spend $1,550.00 on a bottle. Any idea what the note pyramids will be like? My thoughts exactly. I had to look at the image several times before I realised there's a difference!! Don't believe they have been published yet but could be wrong. Yeah good idea, let’s finish the marketing team’s work for them! Neiman Marcus at Tysons has this little set and you can it test them. I quite liked the gold; silver is very masculine on me. Amazing how they make such different fragrances with the same ingredients. A gentle spicy aromatic scent, nice, but kind of unimpressive, though it could be one of those scents that grows on you and becomes something you love after several wears (as it is nice). The main smell seems to be a juniper berry accord, embellished with some spices (most noticeably a warm nutmeg). Sometimes juniper can be cold, bracing, and somewhat bitter, as it comes across in a gin and tonic, or it can be like an evergreen forest with its sweet and fresh pine sap aromas. Here it's more of the latter, with a sweet sap-like smell not too far removed from the main accord that's in CH Men and Bentley Momentum Intense (if you're familiar with both this is a good reference point). But the piney fresh smell of juniper can also convey a cold spiciness depending on how it's treated, with the cool aspects of pine dominating, but here it's more of an aromatic warmth, made even more so with the addition of the nutmeg. It might have some cool, cold qualities in the opening flash, but after that it's all warmth. So in the end it's a very slightly resinous, pine-sap-sweet, warm arromatic fragrance with a soft, gentle presence. It's very pleasant, but also sort of reserved and simple. When it reaches its base it comes across as a soft amber scent with some vanilla, and traces of the aromatic heart still at play. What surprised me? It's not nearly as "silver" as I expected. I was thinking this was going to have cold, bracing icy qualities, a sort of frozen gin and tonic, or some ultra fresh notes, maybe some kind of new synthetic accord. But it's not cold or bracing, and while the main accord definitely feels modern, it's not ultra-fresh in any kind of "silver" sense or in the way of new synthetics. It's a comfortably warm scent. It smells good and it's very easy to wear. The main accord is somewhat unique, other than some comparison to CH Men and Bentley Momentum Intense, but it feels different enough from them for the most part. It also feels modern. There's something about the smooth way the aromatics present themselves and this certain sweet freshness that's at the heart of the composition that feels very current. I also like that it achieves certain qualities with a less-than-typical approach. It's clean without relying on typically clean notes, warm without relying on traditionally warm notes, and sweet without relying on typically sweet notes (for the most part...I'm referring to the juniper berry here, not the amber/vanilla base). I also like that Kurkdjian kept florals out of this. One my main gripes with the his fragrances are that he often indulges in these big, dominant floral notes at the expense of other notes in the fragrance. Aqua Celestia, for example, was ruined this way (in my opinion), as the lime and mint which could have been really nice were driven to the background by this overwhelming mimosa note and floral musk. Not only did it push the scent too far on the feminine side of the spectrum for my liking, it also took away from what were really beautiful mint and lime notes. Don't get me started on Aqua Vitae Forte and APOM Homme. Gentle Fluidity doesn't have any floral notes at all. Finally, I like that Gentle Fluidity Silver is a bit of a departure for Kurkdjian and his Maison line. Most of the MFK fragrances are fairly opulent and have a kind of fancy, dressy appeal. Many are based around white florals like jasmine and orange blossom. A lot of them have a very over-the-top white-glove cleanliness. Even the more laid back scents like AU and Petit Matin, they're firmly rooted in this kind of thing. Kurkdjian took a new approach here. Next to Amyris Homme, this is probably his most laid-back scent. Performance. It's more reserved than I'd prefer. It could be at least 100% stronger and still be completely okay, with an average sort of performance. It doesn't project much at all and its longevity is about 5 hours. My only hope is that this is "new bottle syndrome" and not the fragrance itself. I often find scents weak and short-lived the first time I test them, only to find out that they become much stronger and longer lasting by a few weeks later. The other thing that I'm not crazy about here is that it's not particularly interesting. Kurkdjian isn't exactly exploring new ground here (though it's different as far as the MFK line goes), and it's a relatively simple fragrance. There's no wow factor here at all, and I'm sure some of that has to do with its poor projection. Maybe it could feel more impressive if it had more oomph, but still, it's not the kind of scent that's going to raise any eyebrows. Mugler's Alien Man has been panned for playing it safe and releasing something deemed reserved and simple/boring, but I find Alien Man to not only be a much stronger fragrance in terms of performance (much, much stronger), but also more complex, and perhaps more interesting too depending how you look at it. While I find the main accord in Gentle Fluidity more modern, and its territory less tread upon than Alien Man, there's more gong on in Alien Man, even if it some of it may seem as if it's appeared in many other woody spicy fragrances in the past. Just to be clear, the two smell absolutely nothing alike, I'm just comparing them in terms of how interesting (or uninteresting) they are and how you may feel about Gentle Fluidity when you try it for yourself. Anyway, it's definitely something I'll have no problem wearing while I try to figure it out more. It's a pleasant, easy wear, and I do enjoy the nice aromatic warmth it conveys. But whether or not I'll feel compelled to wear it after this week is yet to be seen. Great write up, Buysblind! You described ‘juniper berry’ note very well and I too(?) prefer it on the bracing, ‘cold mountain air’ side. Will look out for this duo if they ever make an appearance here. Good pointer about the likely shifts in perception as we spend more time with a scent. I remember thinking MFK APOM was fleeting and weak, lol. didn't like either of them. agree with reviewers that said silver has more than a passing similarity with GIT...think a little herbal & soapy. Absolutely. A modern clone of GIT. As for Gold version, it's nice and feminine, reminds of YSL Cinema for a 20 years old crowd. I didn't get any association with GIT from the Silver. To me it reminding me very strongly of Hugo by Hugo Boss which I absolutely detest so this is a strong pass for me. Shame as Kurkdijan is one of my favourite perfumers. Silver smells nothing like GIT. I didn't get any association with GIT from the Silver. Best Maison Francis Kurkdjian Oud?